The 1970's, ladies and gentlemen. So. Imagine you're shown this picture, and told "One of these Star Trek cast members is gay. Guess which one." Sulu'd be about third or fourth choice to me. What I kind of forgot to say last night but implied was that it's funny. He looks kinda fabulous in that pic, but EVERYONE ELSE LOOKS MORESO. 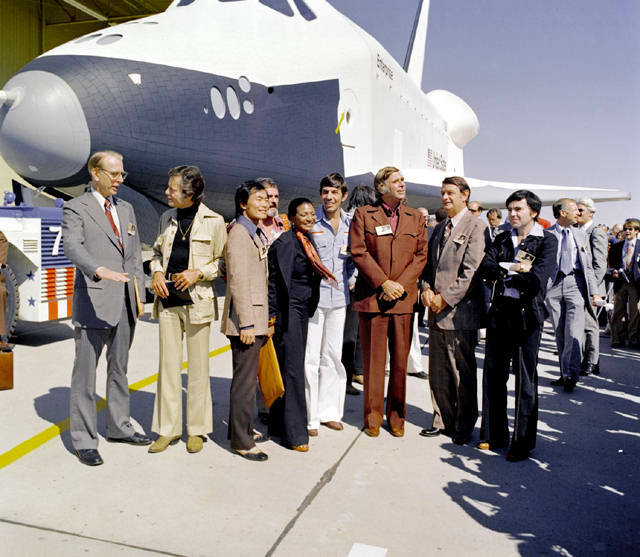 Who is the guy between Rodenberry and Koenig? Like Warphammer, I'm curious if that's Lucas back there, too. Here's the thing though. Most of them looked GOOD. Damn good even. FOR THE 70'S. Oy, Leonard. What were you THINKING in that decade. Very true. There is some style here, they're not precisely club 54 trendy but don't look out of place int he photo. EVERYONE is dressed like that. Unless Nimoy's wearing some sort of chuttle crew shirt, it's just not riiiight. He was the last one we spotted in that pic. "It's Roddenberry, and Bones and Sulu, and Chekov.." .. "Is.. that..SPOCK?" Wow, I think you could -land- the shuttle on Chekhov's lapels.